Beefing up Heinlein’s busy, circular narrative to feature length, writer-directors Michael and Peter Spierig invent an action-movie dimension—a bomb threat that the hero repeatedly travels through time to confront, à la Denzel Washington in Tony Scott’s great Déjà Vu. Landing back in 1975, when the terrorist attack will occur, a nameless Temporal Agent (Ethan Hawke) tends bar at an NYC watering hole. It’s here that he meets The Unmarried Mother (Sarah Snook), a young transgender advice columnist hardened by the hard life he’s already endured. 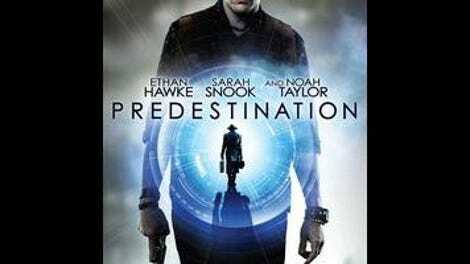 A hefty portion of Predestination is devoted to the story this mysterious stranger tells—an extended flashback to his life as an orphan, his participation in a NASA training program, and an undesired transition from “she” to “he.” Like any good barkeep, Hawke’s character mostly just listens, occasionally interjecting with a pertinent question. The Spierigs, Aussie siblings who previously cast Hawke in the reasonably clever vampire flick Daybreakers, counteract the talky density of their adapted material with plenty of sleek style. They’re operating in a mode that might fairly be described as budget Nolan, with Peter himself composing an urgent, imitation-Hans Zimmer score and the two filmmakers repurposing some famous sci-fi quotes as Memento-lite reminders. (The notes read: “Never do yesterday what should be done tomorrow” and “If at last you do succeed, never try again.”) The period detail, evoking several foregone decades, is convincing without drawing too much attention to itself. And the sci-fi trappings are endearingly analog; the time machine is a portable, unfussy, suitcase-like device, and the Spierigs use what looks like a simple editing trick to visualize its power, splicing Hawke out of frame when he “jumps” and scattering the objects left in his wake. 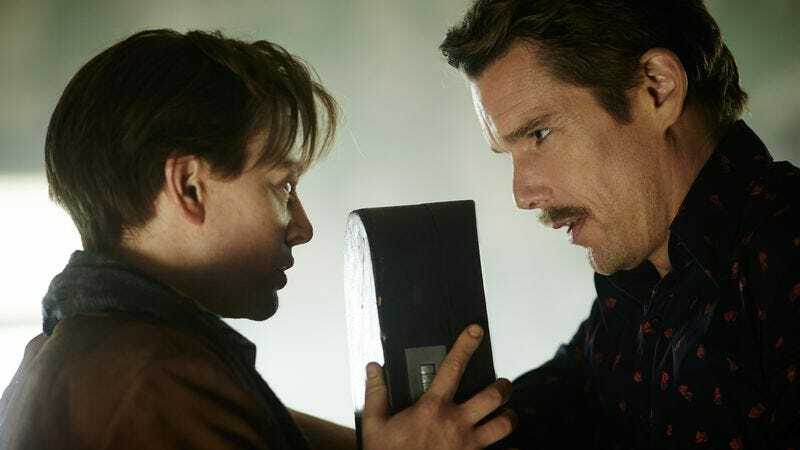 Like the self-devouring snake it deploys as a metaphor, Predestination is constantly circling back on itself, and the film isn’t about much more than the byzantine architecture of its plotting. It’s not quite an empty exercise, though, and that’s mostly because of the conviction with which a small cast tackles a ludicrously convoluted scenario. Leaning on his weathered good looks and increasingly gruff voice, Hawke is clearly punching the genre-movie clock, but there’s a certain cross-project resonance to his role: As in Before Sunset and Before Midnight, which he co-wrote, the actor is playing a man trying to reconcile who he is, who he was, and who he might become. The film’s true revelation, though, is Snook, whose most prominent prior role was in last year’s hoary horror film Jessabelle. Fluidly swapping genders, in what ultimately amounts to something of a dual part, she embeds the twisty machinations of the story with actual emotional stakes—an identity crisis the filmmakers don’t entirely know how to handle. 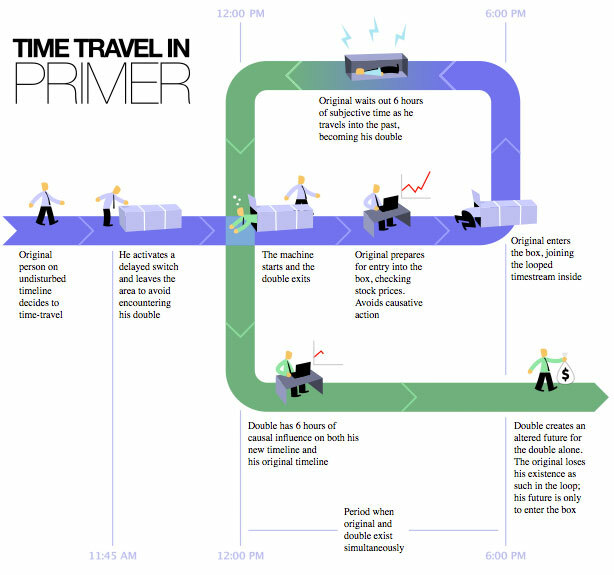 Per the time-honored traditions of time-travel cinema, Predestination just wants to blow minds. But in its best moments, the ones that put Snook front and center, it threatens to break hearts instead. For thoughts on, and a place to discuss, plot details not disclosed in this review, visit Predestination’s Spoiler Space.